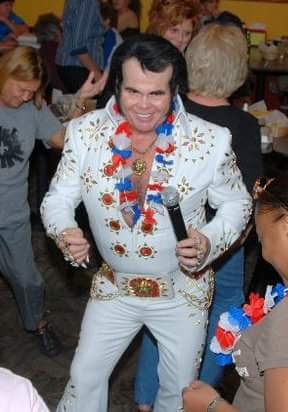 We offer a full show with complete costumes World renowned and Nationally awarded Elvis Presley tribute artist. I have won awards all thru the Music Industry. I can make your event special by walking around and singing and meeting all guests and giving leis or scarves to all female guests and on birthday or anniversary occasions giving a teddy bear. Surprise party.... Sister (lives in a home-3 ladies physically and mentally challenged). Danny showed up on time in full Elvis Garb and provided an excellent show. He actually exceeded my expectations and he has a great Elvis voice. Everybody had a good time and many got up and danced. I highly recommend Danny Dale!